We landed a great deal on a 32" TV during the holiday madness last year. If I remember right, we paid under $200 for the TV and once I turned it on, I realized why they were able to sell it so cheap. While the picture quality was decent, the audio was terrible! As TV prices (and quality in many cases) come down, it only makes sense that we have seen market for sound bars increase. And while these sound bars do improve the audio quality, they face the same issue with other audio and video components - where to place them when your TV is mounted to the wall? Perhaps we should rename the TV Smart Shelf™ to the sound bar shelf! 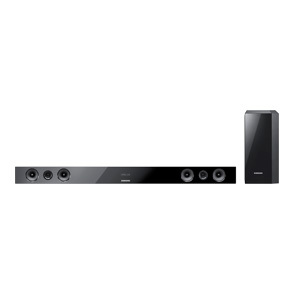 One of the highest rated sound bars I've found is the Samsung AudioBar with Wireless Subwoofer (HW-E450). I have a Samsung TV and the picture is one of the bets I've seen. Combine this with the high ratings on Amazon and other sites for the HW-E450 and it's enough to make we overlook the less expensive audio bars. Most of the installs that I have seen for sound bars are either the equipment attached directly to the wall or placed on large furniture stands. While the former has a nice clean look, it again requires drilling into the wall and running cables in the wall if the sound bar you choose isn't wireless. The later again defeats the purpose of wall mounting your television by taking up just as much space as an old CRT model TV. The TV Smart Shelf not only works well for your DVD player and cable box, but also works great for soundbars - providing a secure place for your bar and a way to run the cords to your TV and power outlet without drilling into the wall. The 40" Samsung model above looks great on a 48" TV Smart Shelf.